This gorgeous rayon velvet flocking powder will add a soft fuzzy feel and velvety look to all of your creative project ideas! VOLUME - approximately half a cup (4oz)/ 118ml packaged in reclosable bag 3"X4". COVERAGE - 2 square feet if reclaiming and reusing excess. SAMPLE bags for $1.25 contain a teaspoon of flock in one color. Please specify color choice by adding a note to seller in your shopping cart at time of purchase. If no color is specifically stated, a random color will be sent automatically. 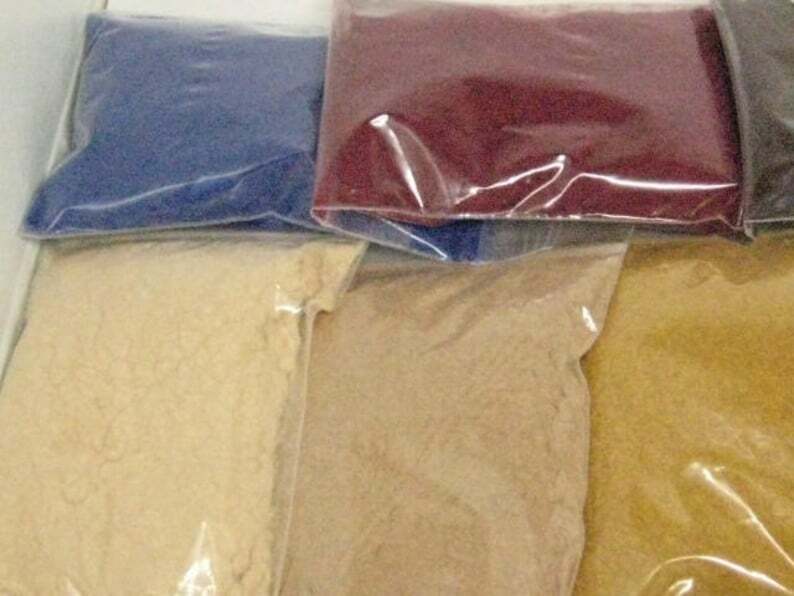 SELECT COLORS ON SALE - half ounce bag size. Sale price is reflected during color choice. Deep purple - a dark royal purple. Wine - a dark reddish brown. CUSTOM BLENDS - happy to blend 2 or more colors together for a unique project look! Add a note to seller in your cart with color choices. USING FLOCK - flock looks best when used over the same color or similar color item. Item should be clean and dry. Flock can be messy. I prefer to work over a big sheet of wax paper, as the excess that falls will not stick and I can easily reclaim that excess for future use. For crafting, apply glue to your item, then add a liberal amount of flock. Press gently. Allow to completely dry,then brush away any excess and reclaim back into your package. For velvet nails, apply 1st coat of polish to all nails being done and allow to dry fully. If doing on more than just 1 nail, this second step do only 1 nail at a time. Add a second slightly thicker coat of polish. Immediate sprinkle a thick coat of flock over the entire nail. Press down gently. Shake your finger to get off the larger excess. Proceed to next nail. After all nails have dried completely, gently brush away any excess from the top of the nail and reclaim back to your package for future use. Such fun to work with this flocking.its superfine.